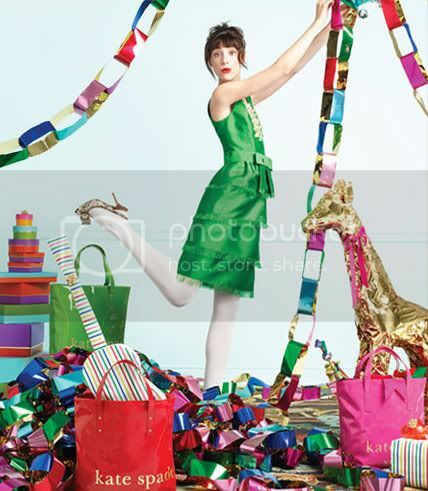 deliciously organized: Solved Early: Gift Wrap Madness! Solved Early: Gift Wrap Madness! 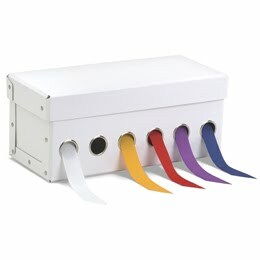 I think below is a great way to create your own organization system by purchasing different sized clear boxes to store the ribbon, tags, etc. There are several ways to make the gift wrapping flow smoothly come wrap time! I hope one of these ideas is helpful! AND whatever Holiday you may celebrate, if your gifts are already wrapped and ready to go, I have to say I give you a LOT of credit for getting it done ahead of time! I'm very jealous! What great ideas!! I really like the second cabinet - very discreet!! I love those ideas. I just have the big clear box that I store under my guest room bed. I did shop early this year but I haven't started wrapping yet. oh my goodness, that opening cabinet is exactly what I have been dreaming of! LOVE all these ideas- there are some great ones here! What about an idea for an apartment the size of a shoe box? hahaha,where do I store my 100 rolls of ribbon and paper? I have a little collection problem as you can see. Also, lets have a big wrap/bake/craft/cook party? What do you think? Those are amazing!! esp the first one from Ballard. I feel the same way! I usually don't start the shopping until I'm finished with school. Which doesn't leave a lot of time! Love the images! Maybe some day I'll get my ribbon to look like that... Ha! These are some great ideas! 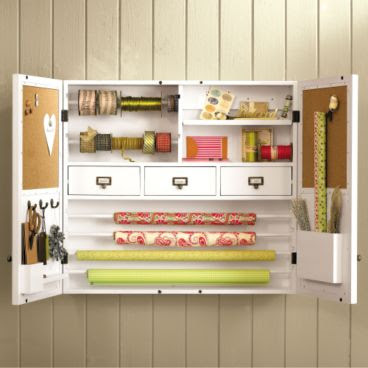 I am in the process of helping my mom turn a walk-in closet into a mini craft/sewing room and we have been trying to come up with ways to organize gift wrapping supplies. 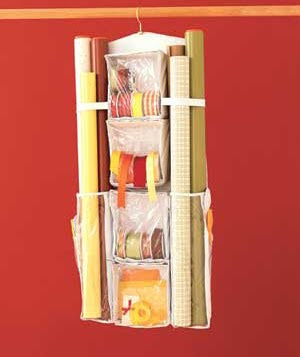 I have also seen curtain rods mounted on the wall to hold wrapping paper rolls and am thinking about incorporating that as well! I think I have a problem. None of those solutions will house my ginormous "collection" of paper, bags, ribbon, tulle, etc. Ok, I don't "think" I have a problem. I know I have one! Love the pant holder idea. I hadn't seen that before. That hanger system seems very handy! I'll do anything for more floor space :). I am organizing today...you've inspired me. i even went to IKEA and purchased the magazine boxes! 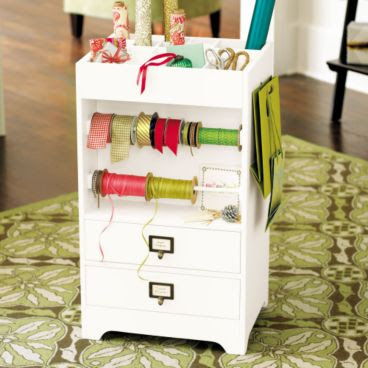 adorable collections of gift wrap + well thought out storage solutions makes me purr! I can't believe I never thought of the pant hanger thing! THAT is perfect! Doing that immediately! 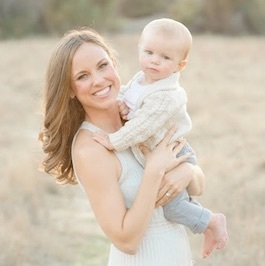 another great post... Ballard Designs to the rescue! 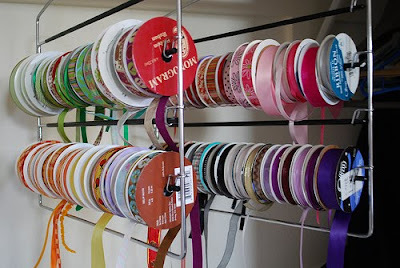 Ribbons on the tie rack...brilliant! Those are such great ideas! 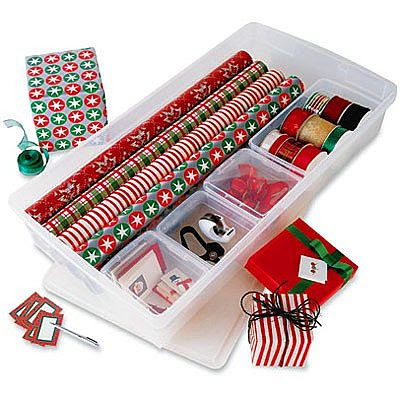 There is nothing better than having disorganized gift wrapping supplies. I am always wrapping gifts for my mom or dad and at work. 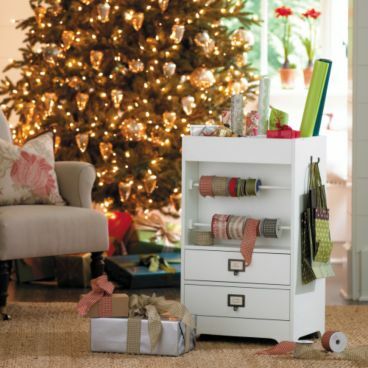 I would love to have a wrapping station that I could keep everything organized! Thanks for the comment on my blog :) I'm glad you led me to yours bec. I'm sure you could teach me a few things. Decorating, I love; organizing, I'm not so great at! Keep in touch. I would love the one from Ballard, but I've seen the price-not in the budget. Thanks for your comment on my blog. You didn't miss the recipe. Im just waiting til I actually make the whole batch so I can share the recipe and the pacaking. the hangers would work great for our smaller space. I am one to have Christmas shopping almost done:) I am such a dork, I know. I wish I had somewhere to keep something like this. I could probably spend more money on organizing my wrapping station than I do on actual gifts. just mentioned you in my post! It will be great if I have a somewhere to keep all of my accessories like that. I like your recommedation. They are great and useful to organize things. I love these ideas for giftwrap - I collect all sorts of bits of stationary/wrap and have them all over the place so these are great inspiration. Just one questions - I looked on Ballard Designs for the two cabinets that you have referenced from there, but can't find them anywhere! Any help in tracking them down would be gratefully received. Thank you!